I’m excited to announce an innovative new therapy that will be released in tandem with my new book The Honest Truth About Dishonesty. I developed it with a team of medical doctors and behavioral economists to treat a broad spectrum of disorders. Cureall (Fixeverything) works to combat the tendency toward self-deception and dishonesty, which, like bacteria in the human body, affect everyone (some more than others). 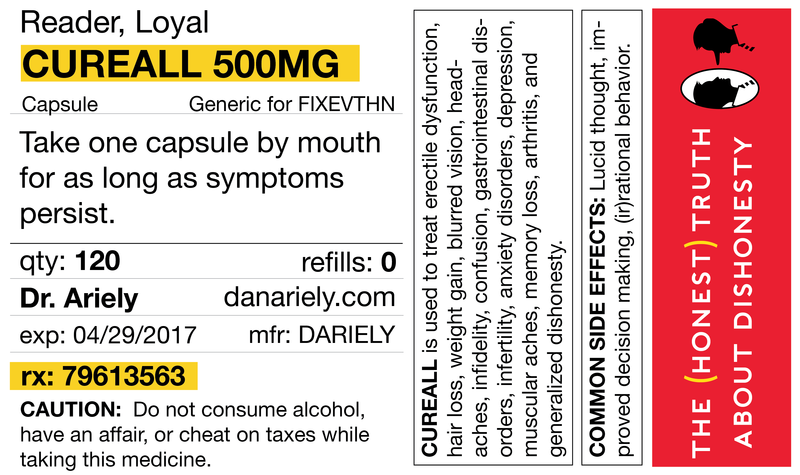 Cureall is indicated for symptoms ranging from nervous headaches (which often result from faking our credentials to employers) to gastrointestinal disorders (a common side effect of seeing family and friends commit a dishonest act). Talk to your doctor about getting a prescription for Cureall, and watch as your lucidity, honesty, and energy levels go through the roof.